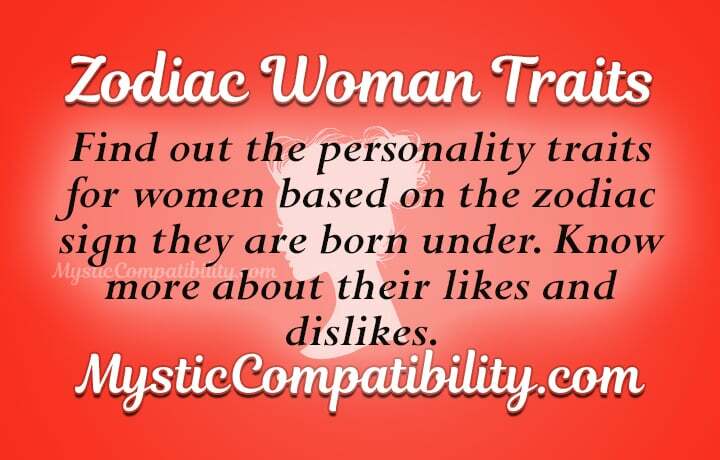 Let’s take a look at the woman personality traits by zodiac sign. The Aries woman personality is loyal to her friends and family, but she might not be ready to commit to a romantic relationship just yet. The Aries woman loves excitement and challenges. She is independent enough to go off jetsetting on her own. She does not need any approval, because she is confident and outwardly strong. But a good word makes her happy and raise her self-esteem. The Aries Woman can be impulsive, whether with shopping or in life. As an action zodiac sign, Aries will try to make many of her ideas come true. Negatively, Aries’s spontaneity makes her whimsical and hard to predict. An Aries lady wants a partner who can help her conquer the world, or at least allow her to shine in the foreground. Even though Aries girl is strong and independent, when she commits to a relationship, she is usually loyal. She is generous and understanding to the people she cares about, particularly when they look after her needs. Passionate and energetic, Aries female is also bossy, she does not handle authority well. Aries woman does not need to be saved, she can save herself; at the same time she is not interested in saving others. In astrology. planet Venus rules over Taurus sun sign. Hence Taurus female has feminine tastes. Despite that, the Taurus girl is strong and independent. She is able to work towards her own financial wealth and material goals. Family and friends are important to the Taurean. She is a caring person but not overly maternal. Taurus female has no trouble committing to a relationship, and she expects to have the same level of loyalty. The best way around a female Taurus’ heart are romantic gestures and good food. But make sure that you are serious about wanting this relationship. Taurus female loves to feel special, but she will keep herself in check most of the time. Peace and Harmony are important to Taurus women. They will hide their anger and sadness to avoid worrying those who care. Stress can make the Taurus female lash out at people, because she is not great at asking for help. The tendency to keep things in until she blows up is not healthy emotionally and physically. Taurus woman traits show that she prefers to be in the background helping others shine in the foreground, and they are good at being the supportive person. A Taurus woman puts family first. She will ensure that family members and close friends have all the support she can give. She is most generous when in love. Gemini Woman personality traits show that she has the duality of the sun sign. It feels like she is made up of two separate people. This girl can be fun and bubbly one minute, or cool and aloof the next. The Gemini female loves mental stimulation, and will skip from one activity to the next, always learning new things. If you want to date a Gemini lady, you have to be smart or willing to learn like she does. Her tendency to move towards new things does not mean that she cannot commit to a relationship. She will be a loyal person when she decides to settle down with the right person. The Gemini woman will have trouble controlling her emotions during teenage years. Until she finds her groove, she will suffer from peer pressure and some confusion. She wants to fit in, and yet she also wants to be unique. Gemini women can suffer from depression and anxiety because they are always overthinking things. Usually she will try to control her feelings alone, or try to discern her emotions analytically. 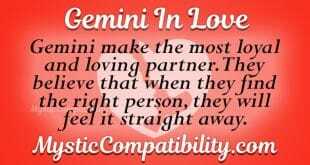 Commitment is an issue for the Gemini woman personality, because she craves stimulation, it is hard to stay in one place. Gemini women also worry that emotions can make them inefficient. So she prefers short term goals than long term aims. If you want to be in a relationship with a Gemini girl, you have to take her traveling, or offer many types of learning experiences to keep her interested in you. Best word to describe a Cancer woman is “mother hen” because she can be overprotective and nagging when it comes to looking after loved ones. The Cancer girl in her family’s eyes is soft, loving and caring person. But the first impression she gives is of an aloof person with a hard exterior. Once you get to know her better, you will realize that she is a shy and sensitive person, a loving girl. The Cancer female traits show that she does not have high self-esteem. She can be moody at times, she is a soft person at heart. Cancer girl needs a long time to feel secure in a relationship, but she is a loyal and committed person, and will look after the chosen partner. The only problem is that the Cancer lady has the tendency to hover around people. Armed with a hard outer shell, Cancer woman tends to have a calm disposition on the outside, but she is moody or upset inside. It is rare that Cancer girl loses her temper, unless someone tells her that her hard work is not good enough, or that she is criticized severely. Cancer women have low self-confidence and need support to feel safe and positive. Leo lady has a charisma that makes her the center of attention in a crowd. Warm and radiant, she loves being noticed by people. Leo girl is creative and loves to show off her creativity, she is a proud woman who knows what she can do. She is a power woman who works hard to get what is rightfully hers. The Leo woman is strong and independent. Her independence and freedom are very important to her. The Leo woman personality traits show that she will not let people push her around. She is cocksure of herself, and has no problem defending herself when someone wrongs her. Leo girl loves to be the center of someone’s life. If you want a successful relationship with the Leo female you have to go all the way, flowers and everything. Once she commits, she needs respect and love, but she will be a mate for life. Leo girl does not do well with authority, because she likes to be the one giving orders. She will aim high and try to shoot for the stars. She has the capability and commitment to get her hands dirty to achieve her goal. The Leo woman exudes self- confidence that allows her to be successful, and she can be supportive to people who need it. Virgo women characteristics show that she is not a frigid and uncaring person. But a shy and loving person who takes time to warm up to people. Virgo woman is a perfectionist with good attention to detail. She is shy and prefers to work behind the scenes to help someone else shine. Virgo sun sign is independent. She is intelligent and has a rational train of thought, a person you want on your team if the devil is in the details. Despite her organizational skills and need to be orderly, Virgo female has problems sorting out her own emotions. Virgo women have trouble with self-confidence, any criticism may break her down. She likes to keep herself busy with projects that means something to her, she wants to help people. Virgo girl will happily look after friends and family, with focus on health. The Virgo lady is more comfortable working in a background. She is a caring and loyal friend, who will watch your back. Although she might seem to want a perfect partner, she needs someone who can accept her for who she is. Virgo girl is a loyal and loving partner if she commits to a relationship or a partnership. You can trust that she will look after you. The Libra woman personality pays a lot of attention on aesthetics. Hence she will always look beautiful and well groomed. Your first impression of her may be aloof and arrogant. But the Libra girl is a person who care about justice and equality. She is capable of arguing her point across and defending the weak, and she is a good communicator. She is also a romantic person with many ideals. The Libra woman seeks a partner whom will contribute equality in a relationship. She takes time to find someone she can connects with. But Libra is not a star sign who can handle being single for a long time. Libra female has a strong sense of fairness, and is not afraid to balance the scales once they tip. Sometimes, to keep peace, Libra women will swallow their pride and say nothing, or try to be diplomatic in handling situations. Libra girl loves artistic endeavors and pretty things. She also strives to make everyone happy, sometimes on her own expense. It can be annoying when she stays on the fence during an argument to avoid offending anyone. The Libra woman can become emotionally detached when she is stressed, using words to talk the situation through instead of experiencing her feelings. The Scorpio woman experiences intense emotions, and like a scorpion, she needs space and time. Push the Scorpio female too hard, and she will sting and run. Scorpio wants love, but she also fears heartbreak and disappointment. Once she gets to know you, she will transform into a loyal and trustworthy friend for life, she will always look after your back. The Scorpio woman personality traits suggest that she has a suspicious nature, and she is sensitive to superficiality. She can catch a lie easily and will write you off if you try to betray her. Scorpio women can also be control freaks. She demands to be on equal footing in a relationship at the least. She can and will take revenge if you wrong her in anyway. The Scorpio girl is practical person radiating with self-confidence. Even the shy girl will draw attention with her magnetic personality. The Scorpio woman needs time to get to know someone. And, it does take some time before Scorpio is comfortable with a new friend. Scorpio lady is also emotionally stable and can handle stress well, even though she can experience her feelings intensely. A natural leader, the Scorpio woman is a determined person who will stop at nothing to reach a goal. The Sagittarius lady loves her independence and freedom more than anything. She wants to be traveling and learning new things in her life. The Archer wants to be constantly on the hunt, her free spirit can be difficult for her to commit to a relationship. The Sagittarius woman personality is a curious person with a need to find out the answers. Optimistic and idealistic, this girl sees the good things in life. The Archer can be blunt and tactless when it comes to dealing with people, because she believes in her ideals. She has a sense of humor if you can accept it, but it may be annoying at times. Sagittarius women do not mince their words. They are usually well traveled and knowledgeable. She is also happy to share what she has learned during her excursions. She is happiest when she is with people who are very different from her. If you want to have a relationship with the Sagittarius female, you have to either travel with her constantly, or at least be as open-minded. Sagittarius girl needs to be with someone who can ground her, and offer her the freedom she craves. Capricorn woman is a career girl, she can be intimidating because she is a serious sun sign. Capricorn is status conscious and goal-orientated, usually aiming to be working as an executive high up in the corporate ladder. She is tough and ambitious, more comfortable at work than at home. Family is important to her, and is the reason why she works hard. The determination of Capricorn women allow them to reach any goal they set. The Capricorn female is shy when she meets someone new. She is slow to warm up to people, until the ice breaks. She can be lovely and friendly once she gets to know you. The Goat does not have strong self-esteem. Any criticism will make her world come crashing down. She is intelligent enough to make educated decisions, but she may second guess herself when something happens. If you want to be with a Capricorn lady, you might have to pry her off her work. Her dedication to her work and family is admirable, but she can be an all work and no fun Jill. Capricorn woman will most likely be a career mom. And she would want you to respect that side of her. The Goat girl needs a partner who is as smart as she is, or as committed to the relationship as she is. Aquarius woman traits suggest that she is a fun loving, creative and crazy girl with many friends. She is a social butterfly, and will fly off traveling at a moment’s notice. She is always itching to save the world, and she prides herself being a progressive thinker and humanitarian. Aquarius woman loves her freedom and adventure, making new friends and sharing her ideas on how to save the world. Aquarius girl fears boredom, and will always look for new excitements. The Aquarius female loves dishing out advice, but she hates receiving them. She does not care what people think about her, because she has a strong self-confidence. Aquarius women have trouble committing themselves in a routine job. Their wild spirit makes it hard for them to stay in one place for long. She accepts being financially insecure, as long as she can still travel, she is fine. If you want to date an Aquarius girl, being mysterious is one way to attract her attention. It would be easier to be adventurous and go on trips with the Aquarius lady, as it is hard to keep her interested in you for long. While she has no problems committing, she needs to be reassured that she will not be tied down in a boring relationship. Pisces girl does not miss anything during her observations. She is emotionally intuitive, there is no escaping from her. Pisces woman takes on some good qualities of other star signs and allows them to be a unique combination of all the other women in the zodiac signs. Hence the Pisces female is a gentle soul who knows their next move. It is hard to hide from her as she is sensitive to your feelings. The Fish girl is good at adapting to situations and is flexible enough to adjust quickly. If you want to be with a Pisces woman, you have to find out what she likes. In general, being romantic help, but Pisces does not always know what she wants in a relationship at first. Once she knows what to look for in a partner, Pisces lady commits readily and is a loyal friend and partner.